Two years ago, the International Maritime Organisation (IMO) amended the International Convention for the Safety of Life at Sea (SOLAS) introducing the requirement to verify the gross mass of a full container prior its loading on board the vessel. 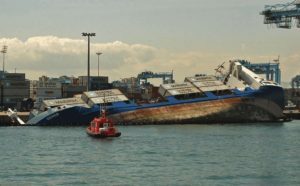 This measure was implemented to prevent cases of container weight misdeclaration, which leads to incorrect vessel stowage and, as a consequence, to loss of vessel stability, possible damage to ships and cargo, injuries of seafarers as well as port workers. The examples are abundant in the shipping practice. One of the most illustrative was MV Deneb, a 100m long 5,350t containership operated by X-Press Container Line, which became unstable and began listing during unloading operations at Algeciras, Spain, in June 2011 (see photo). According to the investigation that followed, out of 168 containers in the load list, 16 boxes (9.5%!) had actual weights exceeding those declared. The total actual weight of these was 278 tons (or 4 times!) more than the declared one. 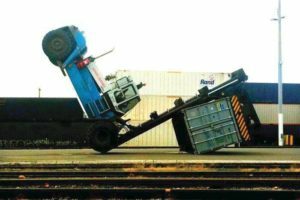 Incidents at container yards are also typical, like this forklift tipped forward by its overloaded container in Melbourne in May 2011. Setting the effective date of 1 July 2016 for the implementation of the new SOLAS requirements, the Maritime Safety Committee also agreed to provide flexibility for 3 months to all the stakeholders to update their procedures and software. Thus, on 1 October 2018 we mark two years since the SOLAS regulation to provide a container’s Verified Gross Mass (VGM) has been enforced. What has changed? And most importantly, has the introduction of the new measures brought any tangible results, apart from placid compliance, extra costs and tasks? Has it added more discipline to the supply chain? According to the recent statement of APM Terminals, the accuracy of the submitted weight data still needs attention.The random checks carried out at the company’s terminals demonstrate that some containers with inaccurate VGM that were weighed at factories or on the way to terminals, may slip through. Moreover, the global terminal operator identified some scenarios, where inaccurate VGMs may increase risk. “Operators of, for example, deck cranes may be tempted to trust the VGM and override the crane’s overweight load alarm,” explains Praful Waghela. To overcome this, APMT has made technical and procedural changes for specific crane types, which now automatically shut down pending further investigation if weight limits are exceeded. The outlined problems confirm that the human factor, or mindset, is the cornerstone of success of any initiative.